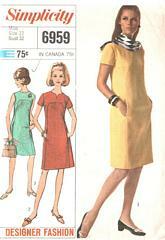 Vintage Simplicity Designer Fashion pattern 6959. Lined, collarless dress with front seam interest has slightly lowered round neckline, back zipper and pockets concealed in side front seams. Sleeveless or short set in sleeves. Optional V cutout on neckline.